Neil Patel is the co-founder of two Internet companies: Crazy Egg and KISSmetrics. 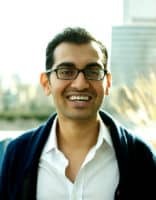 Through his entrepreneurial career Neil Patel has helped large corporations such as Amazon, AOL, GM, HP and Viacom make more money from the web. By the age of 21 not only was he named one of the top influencers on the web according to the Wall Street Journal, but he was also named one of the top entrepreneurs in the nation by Entrepreneur Magazine. Neil Patel has also been recognized as a top 100 entrepreneur under the age of 30 by President Obama. Neil has also received Congressional Recognition from the U.S. House of Representatives for his work in the nonprofit sector. Neil Patel shares the highs and lows of his extrepreneurial career by speaking to organisations, groups and businesses at conferences and events. Neil can speak on anything from marketing, to entrepreneurship, to motivating people to be proactive with their lives. He believes that if you want to succeed in the corporate world, getting up on stage and speaking about your business and brand is an important part to growing your business income.